108 Bespoke is your personal stylist and tailor when it comes to getting looking sharp at boardroom meetings or dapper while getting hitched. After all, we think clothes maketh the man! If there’s any look a man should aspire to is that of Colin Firth wearing his impeccable pinstripe suit and looking sharp as ever while fighting goons in the movie Kingsman: The Secret Service. Or any James Bond, for that matter! How? Thanks to Indiranagar’s very own studio, 108 Bespoke. A swanky studio located on 100 Feet Road, it specialises in designing formal shirts, trousers, and suits to occasion-wear that includes OTT sherwanis and dapper-looking bandhgalas, customised to your preferences, size and persona. The studio looks pretty much like a retail shop with plenty of on-trend pieces on display that patrons can try and get an idea of what 108 Bespoke does. 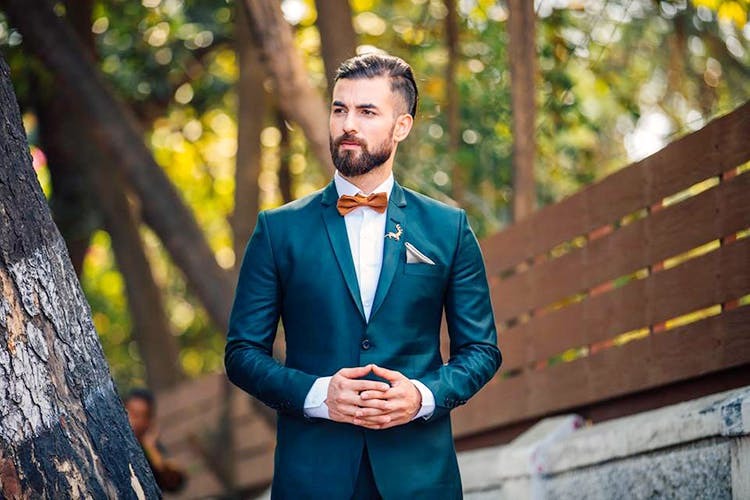 Tell them your requirement in terms of whether you are looking for something to wear for a cocktail party or something ethnic for weddings and sangeets and choose colours that work best for the time of the occasion and your preference. Materials available are cotton and woollen from brands such as Raymond and Huddersfield, for suits, shirts, and trousers or embroidered silks and jacquard for Indo-western suits. Next comes choosing the design, either from their catalogue or a design that you have in mind (like an image of David Beckham in a suit or even Neil Patrick Harris as Barney Stinson). The nitty-gritty design details are finalised, from choosing the kind of lapel you want for your suit to having a custom label for your cuffs. Once measured, it's time for the first trial in eight to 10 days. Before you know it, you will be wearing that pinstripe suit or that sherwani that looks straight out of a Bollywood wedding sequence. Throw in a dedicated service, an express delivery option, and plenty of accessories from cufflinks and suspenders to bow-ties and ties to go with your clothes, you could well have attended Prince Harry’s wedding! The production happens at the Sheshadripuram store and their minimum delivery period is two weeks, so plan backwards while availing their services. The studio also does bespoke clothing for women and that includes suits, dresses, skirts, and formal wear.